A few months ago, Fstoppers reviewed a variety of gimbals and we picked our favorite one for the Panasonic GH5. Just after we published our comparison, the Moza Air 3 Axis Gimbal was released and they decided to send us one. The Zhiyun-Tech Crane is still amazing, but the Moza Air is now our favorite gimbal. The first thing to note about the Moza Air is the case it comes in: an easy-to-carry hard case with perfectly shaped foam padding. 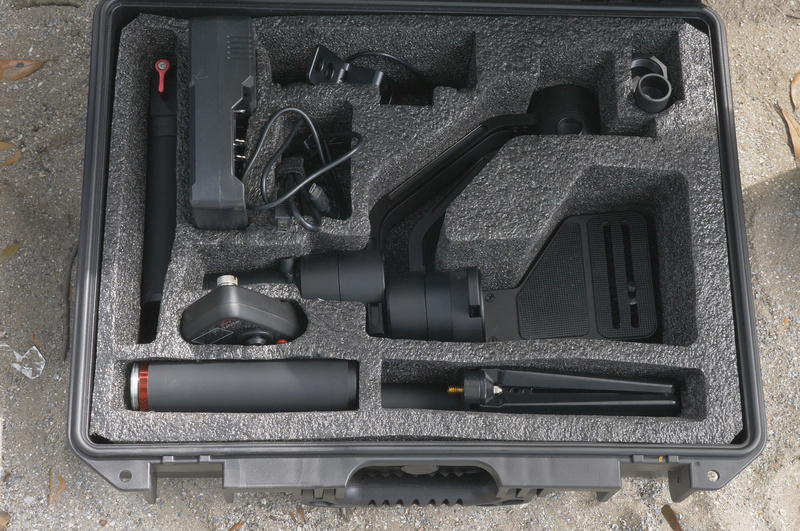 Where many gimbal companies skimp on what comes in the box, Moza throws in just about every accessory you could want on a gimbal for free. 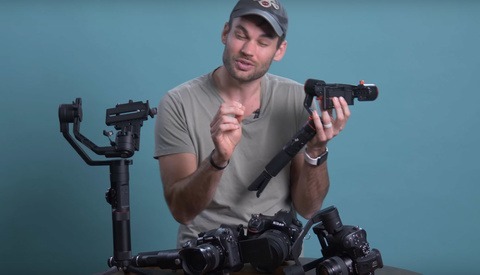 These include all the arms and joints to make the gimbal a two-handed setup, every cable you could need to connect the gimbal to the a range of different cameras, a charger, a wireless remote control, and a sturdy small tripod that allows you easily balance the gimbal or film moving time-lapses. All of this is included in the price of $599. Since we currently film on the Panasonic GH5 and the LCD screen rotates out to the left, we prefer to use gimbals that have arms on the right so that we can clearly see our screen without obstruction. The Moza Air can be controlled using the joystick and power button on the gimbal itself, using the free remote thumb controller, or using a smartphone and the Moza Air Assistant app. The gimbal has four different modes of following motion where the gimbal stays locked in one direction, follows motion only up and down, follows motion only left or right, or follows all motion in any direction. While in any of these modes it's also possible to use the joystick to move the gimbal in any direction. When using the remote thumb controller or the app, additional control features are available. Both options allow you to adjust the follow speed of the gimbal as well as the response speed to joystick movement. This helps choose between quick, sharp motion or slow, smooth movement. 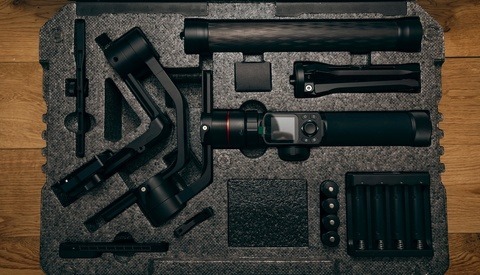 The Moza Air comes with several cable options to connect most major camera brands to the gimbal. This opens up quite a few additional features for control. Using the remote thumb controller while your camera and gimbal are connected allows you to start and stop recording remotely. With Canon cameras, it is also possible to pull focus using the thumb controller. 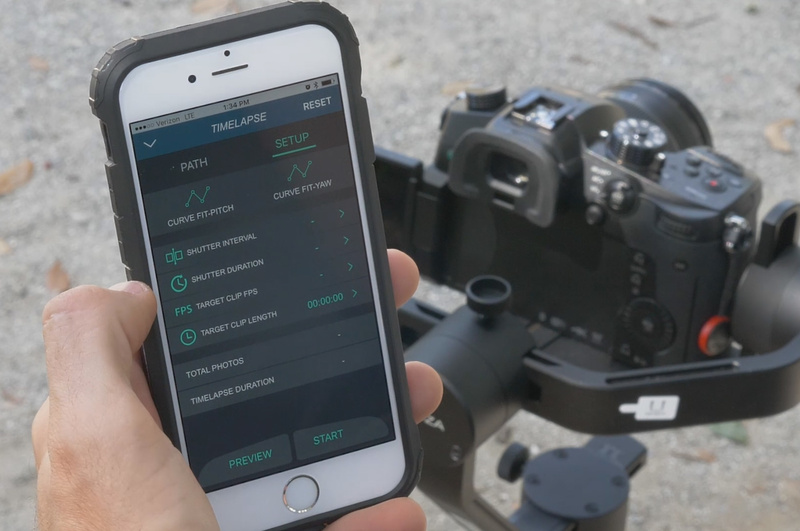 We weren't able to test this feature since we don't use Canon but assuming it works, this is a pretty amazing feature to have available for such an affordable gimbal. One interesting addition to this gimbal is the ability to shoot time-lapses. Details on how to use this feature are included in the video and while it's something that we may not use very often, having it available is quite impressive. Though the variety of control offered with the app and the remote thumb controller are great, it should be noted that the range of each is very short. We found that if we moved more than a few feet away from the gimbal, we lost our connection. Considering all of the features included with the Moza Air 3 Axis Gimbal, the accessories that come in the box, the smooth video it produces, this has replaced the Zhiyun-Tech Crane as our favorite gimbal on the market right now. With that said, we are excited to see how it will compare to the Zhiyun-Tech Crane-2 which will be released soon. Did you see the Crane 2 (not V2) ? Like the moza, it has the tripod, you can have the screen out on the left & a way to control the orientation. 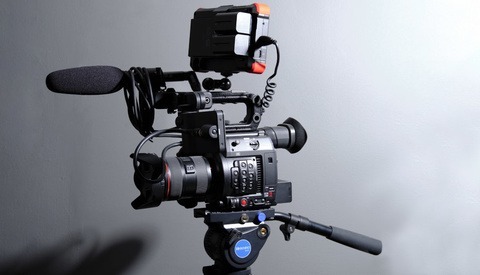 But furthermore, it has follow focus (for supported cameras) !!! But also a damp function when you turn it off so you don’t knock the camera. It seems to really be a fabulous piece of gear. Yes I mention this at the end of the video but we have not yet tested them. They will probably take the lead again. Just sold my Devin Graham Glidecam and got the Crane 2 and it's so much better. Having the record button, ISO and aperture knobs right on the handle is awesome. Much lighter and not as bulky as the Glidecam. This is video is done using it the first day I got it. Some jerking because I didn't have sensitivity set up high enough to keep up with me. Thank you for your review., useful to know and recommend. Good timing Lee. I was just looking at a few different options. Amazing value for money with this one. The Osmo would be amazing if they could somehow incorporate a screen onto the system. If I have to get out my phone and sync everything up, it slows down the whole process and I might as well use a full gimbal with my GH5. And make the ap less buggy. I use it all the time for work (filming ranchers on horseback, atv, etc. but man I get tired of the tilted horizons and recalibration and draining cell phone battery. Thanks for the review! My dilemma right now is I would like to get started with gimbal work but on an iPhone. Partly due to expense and partly due to uncertainty as to whether I will really use/need. However, if there was any form of adapter that would allow a phone to be attached to this model it would certainly make it more attractive. Rather than purchase an iPhone specific model then purchase this. Is there a technical reason why an iPhone couldn't be used on a heavier duty gimbal? Still not a horrible deal if it works as you've reviewed. I used my DJI Osmo tripod ($15 from best buy) and it works great. Just bought this and it's awesome for the money. FYI, you're much better at explaining how to set this thing up than anyone at the company. I stumbled for a while until I watched your video. Thanks! If you ever get tired of being "The Don of Money", you can always become an online how-to tutorial guy. I'm a bit confused by something. I want a gimbal for my Nikon D5500 with a Tamron 16-300mm lens. The combined weight of the body, lens and battery is around 1kg. Anyway, my options are Moza Air and Moza AirCross. The Moza Air advertises as being for mirroless and small DSLR, but the AirCross is only for mirroless. Why is this? The AirCross has a maxium payload of 1.8kg, way over the weight of my camera setup, and the Air is a whopping 3.5kg, which is totally over kill for my setup. So why are some gimbals advertised as being for mirrorless only yet many DSLR setups these days are way under their recommended maximum weight?